Lens Description: Sigma APO Tele Converter 1.4x and 2x are dedicated teleconverter lenses. Due to the high optical quality of this teleconverter, this item will only fit and work with a select list of lenses. Photography Life Review Summary: The Sigma 2.0x teleconverter seems to be a pretty solid choice for Sigma lenses. It works quite well with the new Sigma 120-300mm f/2.8 Sport lens and shows better performance in the center than the TC-20E III when stopped down to f/5.6 range and smaller. Unfortunately, the lens is clearly not suited to be used with Nikkor lenses. Not only does it break the communication between the lens and the camera as noted earlier in this review, but it also causes all kinds of AF issues. This brings up a whole different issue - lens and cross brand compatibility. It looks like none of the Nikon teleconverters will work with Sigma lenses, and none of the Sigma teleconverters are designed to work with Nikon lenses either! 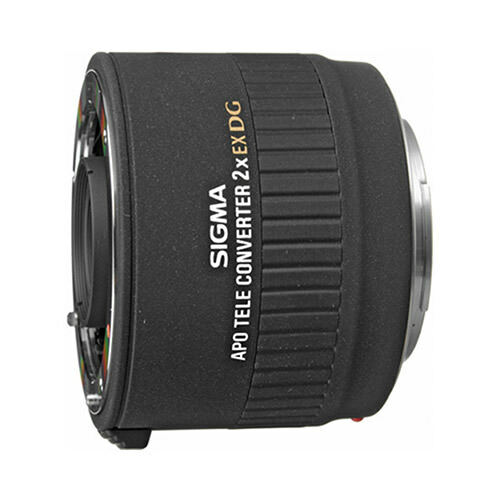 So if you already own Nikon lenses and teleconverters and you are getting yourself the Sigma 120-300mm, you will also have to purchase a Sigma teleconverter with it as well... Read the full Sigma 2x EX DG Teleconverter Review by Photography Life.